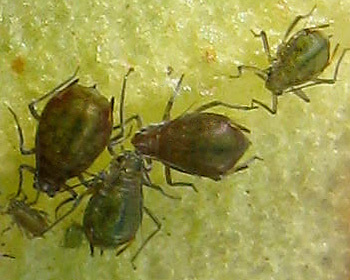 Apterae of Rhopalosiphum nymphaeae are brownish on the primary host (plum), and more or less shiny reddish-brown to dark olive on the secondary host (water lily). The dorsal cuticle has reticulation formed by regularly shaped roundish bead-like spinules. The antennae are about 0.6 times the body length. The terminal process of antennal segment VI is about 3-4 times the length of the base of that segment. On the primary host the apical rostral segment (RIV+V) is 1.0-1.1 times longer than the second hind tarsal segment (HTII). On the secondary host RIV+V is 1.15-1.45 times longer than HTII. The siphunculi are more than twice the length of the cauda and are swollen on the distal half. The cauda is elongate and slender. 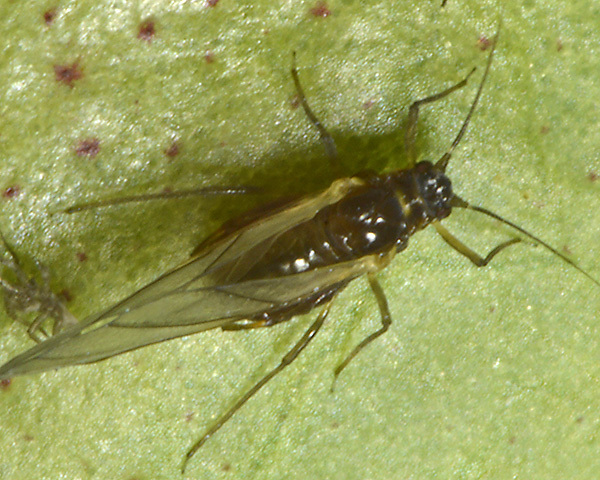 The Rhopalosiphum nymphaeae aptera body length is 1.6-2.6 mm. 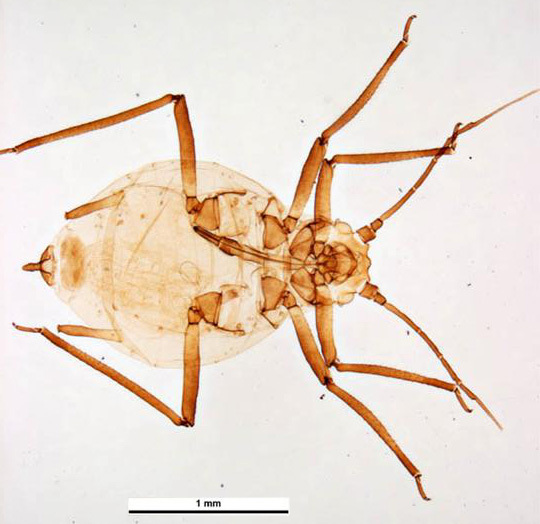 The clarified slide mounts below are of adult viviparous female Rhopalosiphum nymphaeae : wingless, and winged. We have yet to find Rhopalosiphum nymphaeae on its primary host, but we have found it in southern England on water lilies in summer. 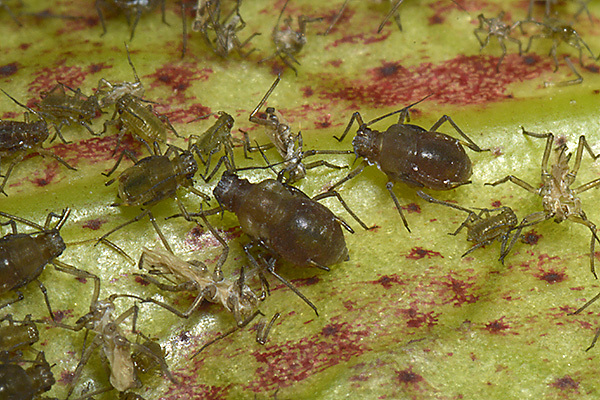 The picture below shows an adult aptera and first instar nymph on water lily. Note the residual whitish grey wax bordering the prothorax. 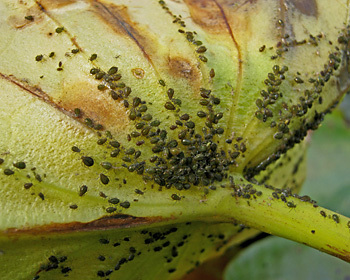 Large colonies may develop on water lilies, the aphids congregating along the leaf veins and invading the flowers. The rate of development, natality and survivorship rates of Rhopalosiphum nymphaeae has been studied in relation to its potential for virus transmission both to crops and aquatic weeds (Ballou et al., 1986). The optimal temperatures for Rhopalosiphum nymphaeae were 21 to 27 °C. Hance et al. (1994) established the life and fertility table on Azolla, an agronomically important aquatic fern used as green manure and fodder. They computed the intrinsic rate of increase which indicated a theoretical doubling in population size every 2.2 days. The various different nymphal instars are shown in the picture below. Storey (2007) looked at host preference by Rhopalosiphum nymphaeae among different related secondary hosts. They tended to prefer the host plant they were reared on, suggesting that familiarity played a role in shaping host preference. 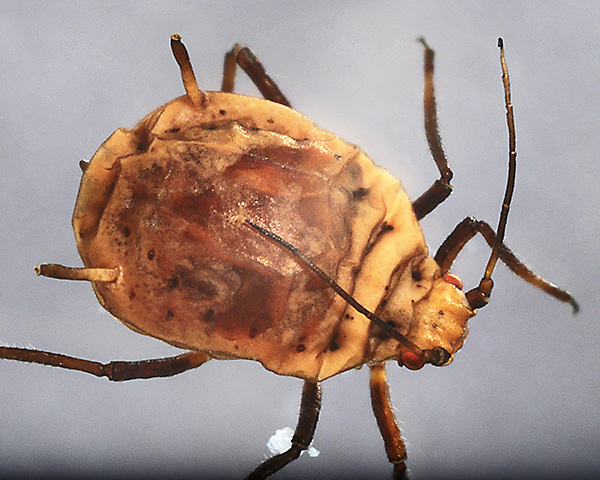 Stroyan (1984) reported that the aphids have some ability to survive underwater by retaining an air film, perhaps by means of the cuticular spinules. Similar behaviour has recently been reported by Simon Leather in his blog, but Bennet & Buckingham (2000) only found them on parts of water plants either at the water surface or rising above the surface of the water. Ali et al. (2009) found that the syrphid Ischidon scutellaris was an especially efficient predator on the water lily aphid. There are also several reports of predation by coccinellids. Saraswati et al. (1990) reported that Meochilus sexmaculatus, Coccinella septempunctata, Micraspis discolor, Brumoides suturalis and Scymnus species 'controlled' populations of Rhopalosiphum nymphaeae in Jan-March on Euyale ferox, a major cash crop in India. Later in the year, winged forms develop (see picture above) and migrants spread to wide variety of water plants before eventually migrating back to fruit trees, the winter host. 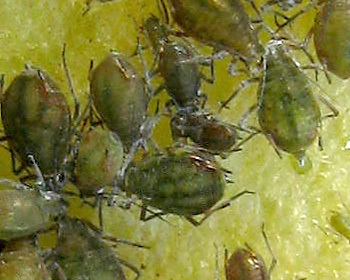 The picture above shows part of a dense colony that developed on water plants in a glasshouse - note the preponderance of fourth instar alatiform nymphs. Rhopalosiphum nymphaeae has been recorded from 27 Prunus species. 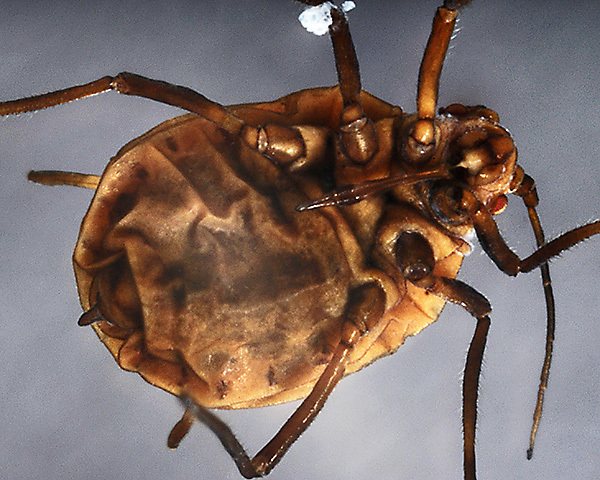 Of those aphid species, Baker (2015) lists 16 as occurring in Britain on one or more of the primary hosts: Aphis craccivora, Aphis fabae, Aphis gossypii Aphis pomi, Aphis spiraecola, Brachycaudus amygdalinus, Brachycaudus cardui, Brachycaudus helichrysi, Brachycaudus persicae, Brachycaudus prunifex, Hyalopterus pruni, Macrosiphum euphorbiae, Myzus lythri, Myzus ornatus, Myzus persicae, Nearctaphis bakeri, Rhopalosiphum padi and Rhopalosiphum rufiabdominale. Rhopalosiphum nymphaeae has been recorded from 10 Nymphaea species. Blackman & Eastop list 4 species of aphid as feeding on water lilies (Nymphaea species) worldwide, and provide formal identification keys. 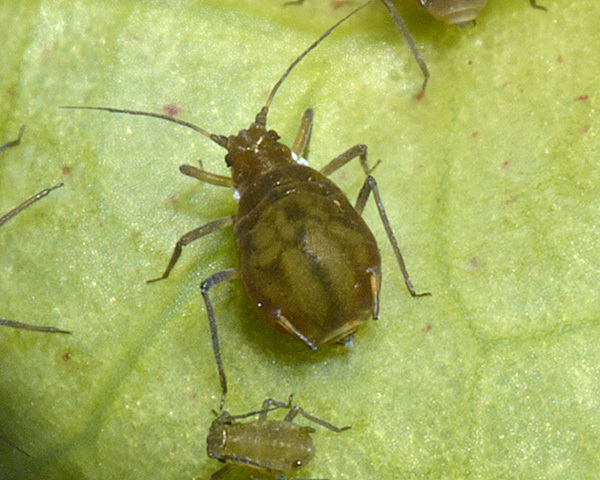 Of those aphid species, Baker (2015) lists all 4 as occurring in Britain: Aphis gossypii, Neomyzus circumflexus, Rhopalosiphum nymphaeae and Rhopalosiphum padi. On fruit trees dense colonies may develop in spring on young shoots causing noticeable distortion of the foliage. Such colonies usually die out by June, and control is seldom required. 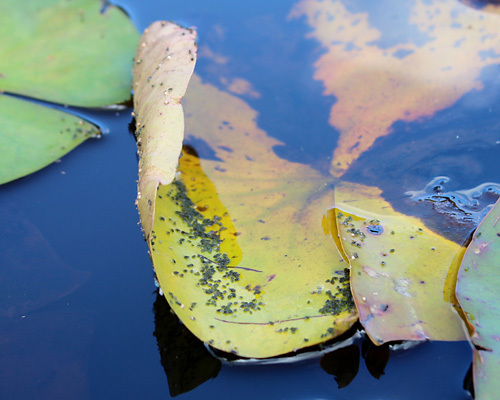 Control on water lily is by forcibly spraying with water to dislodge and drown aphids. Insecticides should not be used as they are toxic to fish and pond life. 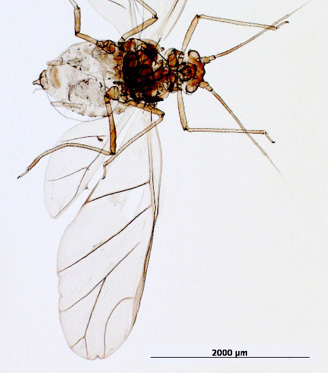 Regarding beneficial effects, Rhopalosiphum nymphaeae has been used for biological control of duckweed (Heteranthera limosa) which is a pest of rice in California. Field experiments showed that the aphids reduced total weed biomass by 58% and 87% in two years (Oraze & Grigarick, 1992). Tomanovic et al. 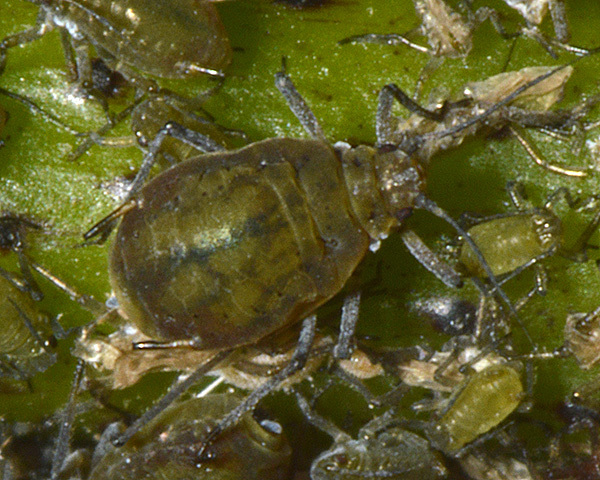 (2012) notes that in Europe the water lily aphid is an important non-crop reservoir for five economically important parasitoids of crop pest aphids, namely Aphidius colemani, Aphidius matricariae, Aphidius rhopalosophi, Lysiphlebus fabarum and Trioxys auctus. We thank Sally Luker for permission to use her images on these pages, and Plumpton College for their kind assistance and permission to sample.